One thing that is so important to us on the Holl & Lane team is giving back. While we're not able to give much, I've made it a goal to donate to a new charity with each of our last few issues. $1 from each sale of our issues goes to a charity based on the theme of each issue. For our September issue on Strength, we donated to UNICEF on behalf of Syrian refugees. For our November issue on Family, we donated to St. Jude's for children's cancer research. And now, for our January issue on Beginnings, we're donating to The Family Abuse Shelter of Miami County. I chose a domestic abuse shelter because I can't think of a beginning bigger than having to start your life over after abuse. We wanted you to get to know more about where your money is going when you purchase our issues, so today I wanted to share with you an interview we did with Molly who works at the shelter. 1. What is the Family Abuse Shelter of Miami? Why is it crucial to have in the Miami County? The Family Abuse Shelter of Miami County is a short-term shelter that houses the homeless and those seeking safety from domestic violence at no charge. It is crucial to have this shelter here because we are the only shelter in Miami County. 2. What makes the Family Abuse Shelter unique? We are a fairly small shelter in a very beautiful historic home in Troy, OH. Our shelter has been around since 1979. So, we really started as a grassroots shelter and pride ourselves in being one of the first small towns to provide shelter to those who needed safety. The fact that our shelter is a house and not a large live in facility makes for a cozy, communal type living situation. Some of our clients are coming from a very uncomfortable, sometimes dangerous situations so it is important for everyone to find comfort here. Staff cooks dinner with the women every night and there is almost always children running around so it tends to feel like a large family. We are unique because we are a full service shelter, so aside from providing food and shelter, we also offer advocacy to help women find jobs and homes. 3. What main services does the Family Abuse Shelter provide? Emergency shelter, safety planning, case management, legal advocacy, and crisis intervention and referral. 4. Are there any common misconceptions about domestic violence or homelessness that you can help us better understand? One of the biggest misconceptions that I hear about the homeless is that they are lazy or refuse to work. This is almost always false. There are a long list of factors that leave a person without a home whether it be addiction, lack of support, or mental illness. With domestic violence when someone hears the word “violence” they tend to automatically assume that it is physical, but this is not always the case. Domestic violence shows itself in many harmful ways including emotional and financial abuse. If a woman is constantly told that she is worthless, she will start to believe it causing immense emotional distress. 5. 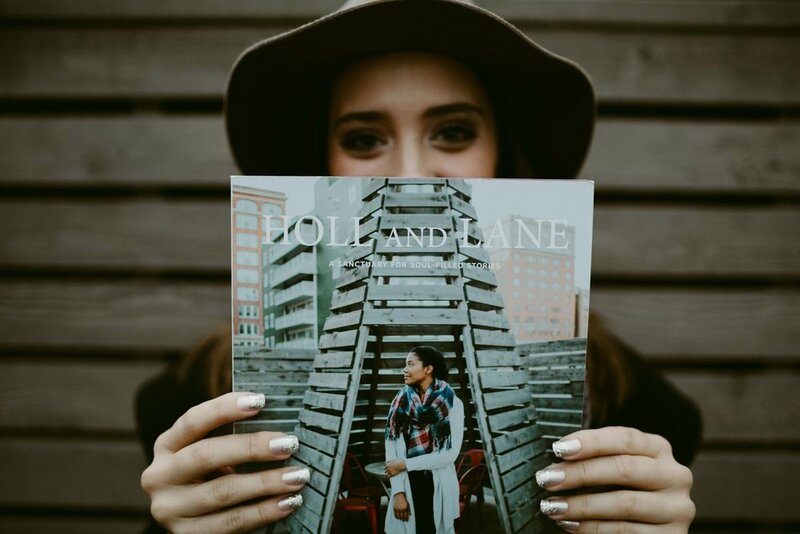 Holl & Lane's Issue 11 theme is "The Beginning." What do the new beginnings that the Family Abuse Shelter is providing mean to those who previously didn't have a safe, stable place to live? We give them hope. We let our clients know that they matter and that they deserve respect. We want our clients to feel empowered when they leave our shelter. Helping them obtain housing and a job is the easy part, but instilling hope and power is when we see real change happen. We also help provide new beginnings with funding that we receive. We use this funding to help our clients obtain housing. If you'd like to donate to The Family Abuse Shelter of Miami County, or learn more about them, please click here.